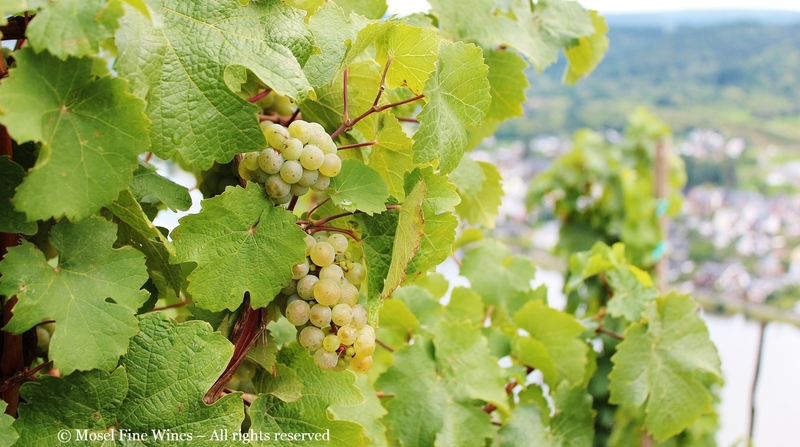 Mosel Vintage 2015 Update | The Harvest has Started! Mosel Vintage 2015 | The Harvest Has Started! After an unsteady month of September, harvest has started throughout the Mosel. Here an update with inputs from winemakers and an outlook going forward. All was nicely on track at the end of August. A late and sometimes uneven flowering was followed by spells of torrid weather. As a result, the Summer brought things forward and winemakers were all in trepid anticipation for a clean and gorgeous September. September proved not as perfect as winemakers would have hoped for. After a first period of dry weather, the weather gods tested the winemakers’ nerves, throwing spells of rainfall for a solid two weeks. Many were not to speak kindly of the weather during the days around the Auctions, when we broached the “how-is-2015-turning-out” subject. Some first nests of rot were developing, especially in the better (and riper) vineyards. However, as Katharina Prüm from Weingut Joh. Jos. Prüm noticed, “this leaves me unfazed: The nights are cool and the weather looks to be turning for the better.” Also Roman Niewodniczanski (Weingut Van Volxem) was all fired up about the quality of the grapes and the better weather prospects. As of September 24, the weather did indeed not only turn for the better. Quite frankly, it turned out nearly ideal: Sunny, not too hot during the day (no more than 18-20°C / 64-68°F) and cool at night. As Reinhard Löwenstein from Weingut Heymann-Löwenstein mentioned, tongue in cheek, “a week ago we were worrying about the state of our grapes. Now the sun is shining and we are happy again: Such is the mind of the winemaker!” before adding that, after clearing the affected grapes, it was clear that the rain did not have as much effect as initially feared and that his vineyards look actually quite gorgeous. Sugar levels rose steadily in September and were already at 80-90° Oechsle by end of September in the most privileged parts of the Mosel (and above 80° Oechsle in the Saar), even if acidity levels remained quite high, given the rather cold weather. Many winemakers in the Middle Mosel and Terrassenmosel started on Monday, September 28, with some Vorlese or negative harvesting, i.e. clearing the vines from bad grapes. In privileged vineyards such as the Brauneberger Juffer and Juffer-Sonnenuhr or Piesporter Goldtröpfchen, some winemakers were already harvesting fruit in for their main wines. This includes Stefan Steinmetz (Weingut Günther Steinmetz), Constantin Richter (Weingut Max Ferd Richter) and Julian Haart (Weingut Julian Haart). The harvest started in earnest yesterday, on October 5, with almost all winemakers, including such late harvesting makers as Weingut Joh. Jos. Prüm, having their full teams on site. So far, with its comparatively high sugar levels and high acidity, the 2015 vintage shows some parallels with 2012 and 1994, which both proved highly successful vintages in the region. So, despite the spell of rain, no wonder that winemakers are all fired up! In fact, there is usually rain in the Mosel in September. Also, a little rain has never stopped Riesling to produce some great wines. In fact, with hindsight, thanks to the rain this September, we possibly have a classic zesty vintage 2015 in store. Without the rain, sugar levels would have soared and acidity plummeted and a very different picture would have emerged. Another impact of the rain in September is that it created a first wave of noble rot grapes. Some winemakers, notably Weingut Egon Müller but also Weingut S.A. Prüm, were out last weekend, selecting grapes for an elusive BA / TBA. Let’s see what October has in store for the Mosel and what will come out of it in the end!